Bedford Eye Care News: Advanced Cell Technology seeks to test embryonic stem cells to treat blindness. Advanced Cell Technology seeks to test embryonic stem cells to treat blindness. Patients with a rare eye disease could be the first to be treated with human embryonic stem cells. Advanced Cell Technology Inc., a Santa Monica-based biotech company with labs in Massachusetts, announced today that it has asked the U.S. Food and Drug Administration for approval to test retinal cells grown from stem cells in 12 people with Stargardt’s macular dystrophy. 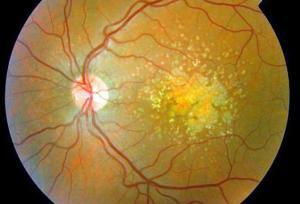 The disease is a childhood version of macular degeneration and affects about one in 10,000 kids. Patients typically begin to lose their central vision between the ages of 6 and 20. As SMD progresses, things may look blurry and distorted, and patients may have trouble adjusting to low light. About half of victims are legally blind by age 50. There is no cure. Most cases occur when children inherent a faulty version of the ABCA4 gene or the CNGB3 gene from both parents. As a result, the photoreceptor cells in the retina don’t get enough fuel, and they atrophy. ACT hopes to reverse this by supplying patients with new retinal pigment epithelium cells derived from human embryonic stem cells. The RPE cells have been shown to improve vision in animals, with one study restoring eye function in sick rats and mice to “near-normal” levels. Another study boosted rats’ vision to 70% that of healthy animals. No adverse side effects were found in any of the company’s pre-clinical studies, Dr. Robert Lanza, ACT’s chief scientific officer, said in an interview. ACT proposes a Phase I/II trial designed to assess the safety and tolerability of its RPE cells. The company and its collaborators would like to recruit a dozen patients with advanced SMD at three sites: the Casey Eye Institute in Portland, Ore.; the University of Massachusetts Memorial Medical Center in Worcester; and the UMDNJ – New Jersey Medical School in Newark. Amid much fanfare, Geron Corp. received FDA approval in January to use specialized nerve cells made out of human embryonic stem cells to treat a handful of patients paralyzed by spinal cord injuries. Those plans are on hold while the company conducts pre-clinical studies to address some safety concerns about its cells, known as GRNOPC1. Last month, Geron said it expected to initiate its clinical trial in the third quarter of 2010. Since their creation in 1998, human embryonic stem cells have been a highly controversial area of medical research. The cells are derived from days-old human embryos, which gives them the ability to grow into any type of cell in the body. Some scientists – like those at ACT and Geron – envision using them to grow replacement tissues to treat sick patients. But many people are troubled by the fact that the stem cells are typically made by dismantling and destroying human embryos. ACT has tried to sidestep the ethical debate by using a different method to create its stem cell lines. Instead of using an entire embryo, the company figured out a way to remove only a single blastomere cell from a three-day-old embryo and turn it into a cell line. Such single-cell biopsies are routinely performed in fertility clinics to screen embryos for devastating genetic diseases, and the procedure leaves the embryo intact. The RPE cells that would be used in the clinical trial were grown from one of the company’s single-blastomere cell lines, Lanza said. The company is also making and testing RPE cells derived from induced pluripotent stem cells. So-called iPS cells behave like embryonic stem cells but are made by reprogramming mature cells taken from children or adults, not from embryos. However, the reprogramming process currently involves viruses and genetic manipulation techniques that make the cells unsuitable for human therapies. Lanza said ACT decided to target Stargardt’s macular dystrophy first because it has been designated an “orphan disease” and could benefit from a faster regulatory review. The FDA has 30 days to respond to the company’s filing, made Wednesday, and the clinical trial could begin early next year. If all goes well, the company plans to seek permission to use its RPE cells to treat age-related macular degeneration, Lanza said. That disorder is much more common, and it destroys the central vision of an estimated 1.75 million Americans.